The Mass Fidelity Core is a great-sounding Bluetooth speaker. Its sound is rich and detailed, and the separation makes music a pleasure to listen to. Its problem is its price, which puts it in the realm of dedicated multi-room setups – alongside such competition the Core feels lacking in features. Bluetooth speakers are all the rage these days. Gone are the stacks of hi-fi equipment and separate speakers that used to be a feature in every living room, replaced by compact streaming-based devices that combine an entire stereo system into a neat little package. The manufacturers that made their names producing the hi-fi gear of old are still around of course, but they’ve been joined by a number of new faces, born in an age of music streaming and Bluetooth connectivity. Mass Fidelity is one such company, and its debut music streamer, the battery-powered Mass Fidelity Core, is the company’s attempt at cracking the Bluetooth speaker market, as well as taking on established music streamers such as the Sonos Play:5. Priced at $499 (£479 / AU pricing tbc), the Mass Fidelity Core is a direct price competitor to the Sonos Play:5, but with wireless connectivity limited to just Bluetooth, is superior portability enough to make the Core a serious contender at this price point? The Mass Fidelity Core sits somewhere between ‘understated’ and ‘statement piece’ on the design scale. Its top is understated all the way. It’s a single piece of shiny acrylic with four buttons: two for volume, one to select the input source, and another to tell it to broadcast to a multi-room setup. There’s also a small LED indicator light which tells you which input is selected. It’ll turn blue for Bluetooth, purple for multi-room, white for aux in, orange for optical in, and green to tell you speakerphone is active. The front and sides are covered in a standard speaker fabric, which conceals the speaker’s five speaker drivers – two front-facing, one downward-facing sub, and finally a left- and right-facing pair. Around the rear you’ll find the inputs. From left to right there's a subwoofer output (although the Core can also transmit wirelessly to the Mass Fidelity sub), aux input, control input (for an IR receiver for example), optical audio in, a USB port (for charging only, not input), and a power port. This list of connectivity options is acceptable for a Bluetooth speaker, and the addition of an optical input is a step up from most other portable offerings, but the list pales in comparison to dedicated multi-room setups, which will normally offer either Google Cast, Spotify Connect, or AirPlay support. 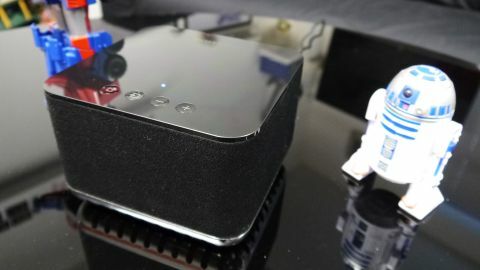 These Wi-Fi-based solutions are more versatile, since they allow you to move around your house freely without having to worry about moving out of range of your speaker. This can be a concern when you’re setting up the Core's multi-room functionality, when you have to move away from your central speaker unit. It’s very easy to get listening to the Mass Fidelity Core. It’s NFC-equipped, so you can simply tap your phone on its top to pair the two – otherwise you’ll need to jump into the Bluetooth settings menu of your device. Once paired we found that our phone had no trouble automatically connecting to the speaker in the future. The Mass Fidelity Core offers multi-room support, but the problem is that you have to set this up every time you want to use it, unlike other systems which remember which speakers are paired together. The way the multi-room functionality works is that you’ll need to press a button on the Core that your device is connected to, which causes it to broadcast. You’ll then need to select multi-room as the input on any other Cores you want music to also play through (it supports up to seven). As well as being unable to remember this pairing after having been turned off, the Core is further limited by its inability to be in a room with another of the same device. Each unit can only operate as a pair of stereo speakers, meaning that if you try to put them in a room together their two channels will conflict horribly. Keep your Cores separate, though, and multi-room performance is solid. Each track keeps in good time, and we couldn’t perceive any drop off in quality. Thankfully our reservations about the Core’s form-factor don’t carry over into its sound quality, which is quite excellent. Listen to a loud piece of pop punk like Alkaline Trio’s This Addiction and the detailing and separation is solid. Despite multiple tracks being layered over one another, each instrument comes through loud and clear, and the sense of stereo is surprisingly good for a speaker of this size. There’s a slight boxiness to the sound at low volumes. This is a speaker that rewards you letting it have a bit of volume, as a listen to Sultans of Swing proves. Turn up the volume and the sound fills out fantastically, including the bass. The only way to get a better level of bass at lower volumes is to invest in a Mass Fidelity Sub (sold separately), but this seems to overcompensate, and provided a little more bass than our second-floor apartment could handle. Finally we turned to Great Round Burn by Kaki King, which provided us with a brilliant full sound, as well as layers that skipped delicately around each other without ever losing definition or clarity. This is a nice-sounding speaker. Tracks have definition and clarity to them, and stereo separation is impressive from a speaker of this size. At louder volumes the sound is rich and full, and easily fills a room. Pairing is quick and easy, and reconnection is just as good. The Mass Fidelity Core is expensive. It’s the same price as Sonos’s multi-room speakers, while offering the more limited functionality of a Bluetooth speaker. There’s no Spotify Connect or Google Cast support for example, and the multi-room pairing is forgotten by the speaker as soon as you turn it off. If you’re after true multi-room functionality then you’d be better off with a non-portable multi-room offering like the identically priced Sonos Play:5, which provides you with more ways to listen, even if you do have to leave it plugged in. Is the Core a Bluetooth speaker or a multi-room speaker? Not even Mass Fidelity knows, and it’s this lack of focus that ultimately ends up harming the speaker the most. If it’s a Bluetooth speaker, then it’s probably one of the most expensive Bluetooth speakers we’ve ever reviewed. Certainly it’s a price that’s backed up by some seriously good sonic abilities – if you’re looking to take your portable Bluetooth listening high-end then this is a good way to do it. But if you’re looking for this speaker to form the basis of a multi-room setup then you may be disappointed. It gets annoying quickly when you have to pair your speakers every time, and Spotify Connect support would be a big help. The Mass Fidelity Core is a very good Bluetooth speaker – but for this price you may have hoped that it had one or two more tricks up its sleeve.